Transgenic animal technology includes the process of inserting functional foreign genes into animals and using them as a tool to research intricate biological processes. Transgenic Animals are animals that have DNA introduced into their cells artificially. These animals become important instruments in exploring regulation of various genetic pathways, gene expression* and cellular processes. By inserting a gene into a live organism, scientists can explore the function of this gene in various environments. Transgenic animals serve a variety of different functions, proving them to be powerful research tools.Transgenic animals can serve as distinctive models for disease, and are made specifically to answer precise biological questions. Scientists use gene insertion to induce human diseases in animals on which they can experiment. 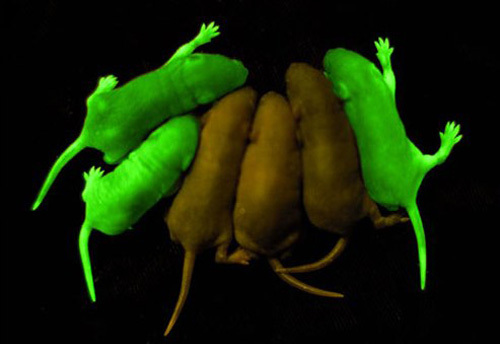 Using these transgenic animals allows scientists to test disease therapy and various drugs. Testing drugs on mice or other rodents is much safer than testing on humans, and much cheaper than testing drugs on higher primates that might share similar human diseases.